Should you have a Canon SL1 as your own. It's a full-featured DSLR, now available with a lens and a nice bundle of accessories for an absurdly affordable price. If you're looking for all the bells and whistles of a DSLR, but don't want to lug around a big, heavy DSLR type of camera, you've found an answer. 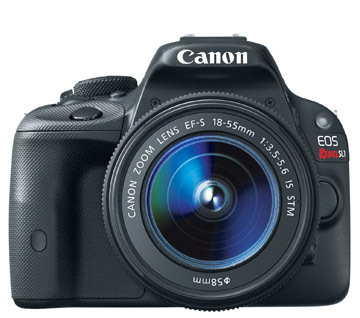 The Canon EOS Rebel SL1, called the 100D in Europe and the EOS Kiss X7 in Japan, was first introduced by Canon in March of 2013. At the time of its release, it was the world's smallest DSLR, weighing it at less than a pound. My friends at DPReview gave this marvel a Gold Award. That doesn't happen very often. Now that it's been on the market for a while and the SL2 has been announced, you can have your hands wrapped around your own Canon DLSR for a bargain. 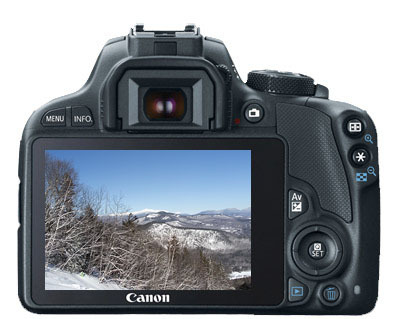 The Canon Rebel SL1 has the specs you'd expect from a DSLR. Full-sized DSLRs aren't for everyone. If you feel they're simply too big and too heavy for you to lug around, go with a compact DSLR. I purposely stayed away from the 1Dx series of Canon DSLRs for that very reason. If you'd love to shoot great photos and have all of features, the Rebel SL1 will appeal to you. Look at the difference in size between the SL1 and my Canon 5D Mark III. The SL1 body weights it at less than a pound. That's about the same as a pint of milk The 5D Mark III weighs almost exactly twice as much at just under 2 pounds. This camera can be used by amateurs who like fully automatic settings or can have fun with the SL1 creative auto mode. Professionals could easily carry this as a nice compact back-up to their full-sized camera body. What has impressed the professional camera reviewers is the remarkable improvement in auto-focus. Video focusing is much better than previous cameras, employing the Hybrid AF II auto focus system. You can tap into the full use of the SL1's brain and use the autofocus point selection or take a little more control and select your own focus point to emphasize a particular spot in your composition. To pick an autofocus point manually on your Canon SL1, follow this 4 step process. Set the camera mode to P, Tv, Av, or M.
Press and release the AF Point Selection button. To choose a single autofocus point, set the camera to Manual AF Point Selection mode. Pick the AF Point you want to use. What are the Canon SL1 pros and cons? There are 3 solid reasons why the Rebel SL1 appeals to many aspiring photographers like yourself and of course, the SL1 has its shortcomings to consider. The pros are size, price, and the number of features. When something this small works so well, it's a good fit. Cameras that are easy to carry get taken along and used. Cameras that are big and bulky get left at home. This camera takes a full range of EF-S lenses which are smaller, lighter, and more affordable than full-sized EF lenses. The Rebel SL1 can also take your existing EF lenses, or any other brand of lens that has a Canon mount on it. It's a good strategy to wait for a year or two after a new camera is released to get a good price. The SL1 was released in 2013. You are at the best time to get yours right now. The bundles being offered by on-line retailers like Adorama, B+H PhotoVideo, and Amazon are ripe for the picking. This is a full featured, DSLR, with interchangeable lenses, with multiple automatic and manual settings, capable of taking spectacular photographs. It's a recent offering that's followed a long history of technology improvements that give you, the creative photographer, lots of options on how you want to create photos. Since it's a genuine Canon DSLR, you have a huge selection of accessories available to expand on your picture taking capabilities and creativity. 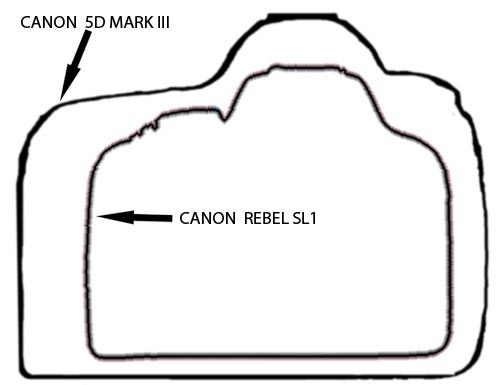 If you are an advanced sport shooter, the Rebel SL1 may be disappointment for you with only 4 frames-per-second. That's a little slow, particularly if you're shooting high school level or higher sports. If you're photographing your 6 year old playing soccer or T-ball, you'll be okay. 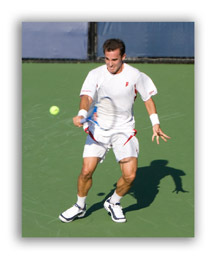 I've taken some striking pro tennis photos using a 3 frames-per-second DSLR (the original Canon 5D), but I would have had more success with a faster camera. A lot of action shots can be missed at that frame rate. Professional sports photographers and enthusiastic soccer moms want more. A rate of 8 or more frames-per-second will give you more chance of getting that once in a lifetime action shot or wildlife photo. 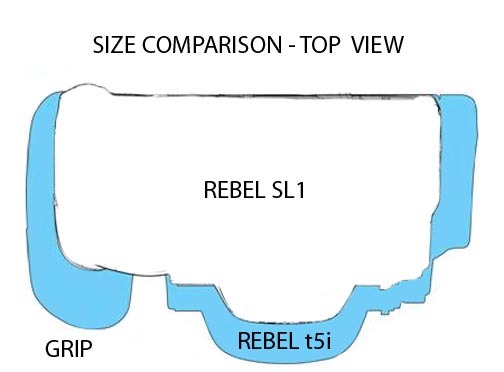 The LCD screen on the back of the Rebel SL1 is not an articulating screen. That's a personal peeve of mine too with the 5D mark III. Probably not a big deal for you. The screen on the SL1 is big and bright, and it's got great resolution. LCD Screen in fixed position. I like to shoot with my camera up high above my head, or down low to the ground. A rotating screen is a nice feature to use occasionally for shooting your selfie too. 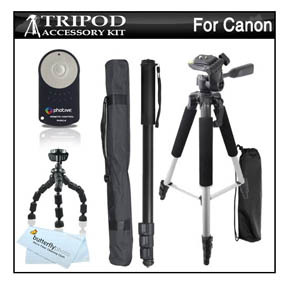 You can get a great bundle that includes the camera body, the standard 18-55mm lens, memory card, small camera bag, and tripod. Right now, these bundles are going for less than $500. That's a ton of camera equipment for the money. 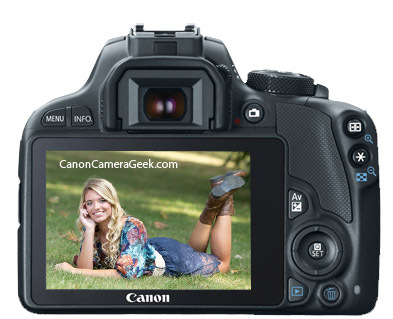 The best thing about the Canon Rebel SL1 cameras? Well okay, two things. They take great photos and they're fun to use! Shoot more Canon photos. Shoot better Canon photos. Where to buy your SL1? Consider Amazon. Number one in customer service. Great place to read buyer reviews. even smaller than a mid-sized t5i.